In this study, we will try to introduce and analyze Fibonacci numbers which were discovered by a mathematician called Leonardo Fibonacci. We will firstly discuss the Fibonacci numbers which have been used in different financial analysis and afterwards their applications and usage in the world life. As discussed in the introduction, the Fibonacci Numbers are given this name due to their discoverer, Leonardo Fibonacci. He was also known as Leonardo of Pisa, Leonardo Pisano or Leonardo Bonacci. He was an Italian mathematician, considered by some people that he was the most talented mathematician of the Middle Ages. Leonardo was born in Pisa, Italy in about 1170s. His father Guglielmo was nicknamed as Bonaccio which means good natured or simple. Leonardo's mother, Alessandra, died when he was nine years old. Leonardo was given the nickname Fibonacci which is most probably derived from Filius Bonacci which means the son of Bonaccio. Guglielmo was directing a trading post in Bugia which is a port at east of Algiers in the in North Africa. As a young boy, Leonardo has traveled there to help his father. This is where he learned about the Hindu-Arabic numeral system. Recognizing that arithmetic with Hindu-Arabic numerals is simpler and more efficient than with Roman numerals, Fibonacci traveled throughout the Mediterranean world to study under the leading Arab mathematicians of the time. Leonardo returned from his travels around 1200. In 1202, at his age of 32, he published what he had learned in Liber Abaci and thereby introduced Hindu-Arabic numerals to Europe. The above development is a milestone in Europe due to their start to use Hindu-Arabic numerals instead of Roman numbers. The Roman numerals were not displaced until the 13th Century AD when Fibonacci published his Liber Abaci which means "The Book of Calculations". Leonardo became a guest of the Emperor Frederick II, who enjoyed mathematics and science. Johannes of Palermo, a member of Frederick II's court, presented a number of problems as challenges to Fibonacci. Three of these problems were solved by Fibonacci and he gives solutions in Flos which he sent to Frederick II. In 1240 the Republic of Pisa honoured Leonardo, referred to as Leonardo Bigollo by granting him a salary. He passed away in 1250. In the 19th century, a statue of Fibonacci was constructed and erected in Pisa. Today it is located in the western gallery of the Camposanto, historical cemetery on the Piazza dei Miracoli. The answer was quite easy that if each pair is born from a pair than the pairs should be added to each other. Therefore, if there is 1 pair, this will make 1 pair. Both of them will make 2 pairs. The last 1 pair and the new 2 pairs will deliver 3 pairs. The new 3 pairs and the former 2 pairs will deliver 5 pair. This will continue as per the rule. 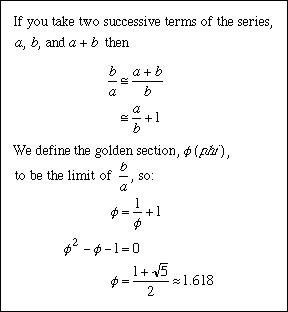 These numbers also lead us to a different subject which is also known as the golden section. This is a special value, closely related to the Fibonacci series and obtained by taking the ratio of successive terms in the Fibonacci series. This is calculated as per the following table. 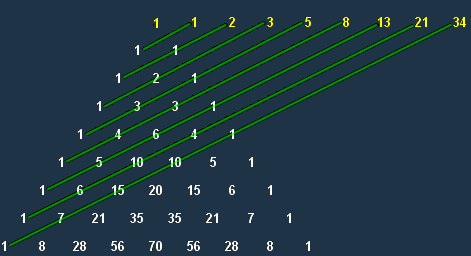 The proof of the golden section is below explained by φ (phi) which is approximately 1.618. 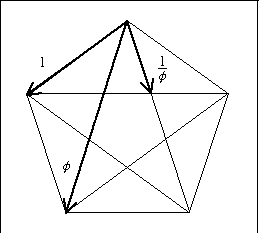 Phi also occurs often in geometry. For example, it is the ratio of the side of a regular pentagon to its diagonal. If we draw in all the diagonals then they each cut each other with the golden ratio too. The resulting pentagram describes a star which forms part of many of the flags of the world. Moreover, 5 is also the 5th of the Fibonacci numbers, including 0, 1, 2, 3, and 5. Ø 5 senses in sight, sound, touch, taste and smell. This is one aspect of Fibonacci numbers. We will also deal with the nature world reflections of Fibonacci numbers. But before doing that we need to show the following rectangular figure. If we start with two small squares of size 1 next to each other. On top of both of these draw a square of size 2 (=1+1). If a curve is drawn between the opposite corners of the rectangles, the following spiral is found. This mechanism is used by the nautilus sea shells. The images of cross-sections of a Nautilus sea shell is depicted below. They show the spiral curve of the shell and the internal chambers that the animal using it adds on as it grows. The chambers provide buoyancy in the water. 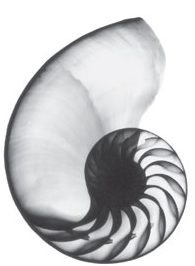 The sea shell is not the only representation of Fibonacci numbers in the real life. For example there is sun flower in which the orange "petals" seem to form spirals curving both to the left and to the right. If we count the spirals to the right as we go outwards, there are 55 spirals. A little further towards the centre and we can count 34 spirals. Both numbers are Fibonacci numbers. One other example is the pinecone. Let’s count the spirals on the pinecone. 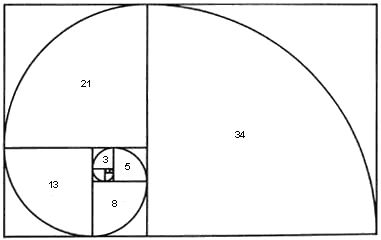 As it is seen from the below figures, there are 13 and 8 spirals which are Fibonacci numbers. One other representation of Fibonacci Numbers is in the Pascal triangle which is one of the key tools in the mathematics. 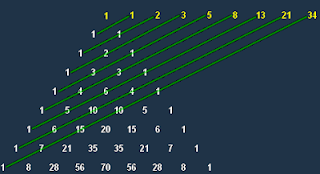 Pascal's Triangle was developed by the French Mathematician Blaise Pascal, is formed by starting with an apex of 1. Every number below in the triangle is the sum of the two numbers diagonally above it to the left and the right, with positions outside the triangle counting as zero. The numbers on diagonals of the triangle add to the Fibonacci series, as shown below. All of the above showed us that Fibonacci numbers are the representations of the natural world happenings. These can be from mathematics, geometry or zoology. However, it shows that discovery of these numbers has affected the science in a very positive manner.